1-Truck assembling (2-10 ton) ,(12-16ton) . The production of buses and trucks is stopped in consequence blockade. 1- buses built on EVICO chassis. 2- buses built on MARCEDIS type /520 chassis. 3- buses built on MARCEDIS type 1636 chassis. 4- buses built on SCANIA type k124IB chassis. 5- buses built on SCANIA type L94 chassis. In 2000 the activities of body factory are transferred from SCMI to SCAI. SCAI build all production lines this activity (body factory) such as , semi- trailor(35-45)ton load capacity , tipper semi- trailor 28 ton load capacity , fixed bodies , tipper bodies ,tankers(36000)lit. and low bed loader (50-70)ton load capacity. 0ne was built on Bazian- Kurdistan . SCAI has contracted with (( general establishment for private projects)) for rehabilitating SULIMANYA refinery in cost $ 65000. 2-water treatment units 50m³/h , 200m³/h. A- in 1992 scai participated in rebuilding 14 July bridge . B- AL sarafyh bridge in 2008. 4- caravans:- scai built more than 500 multiple purpose caravans. 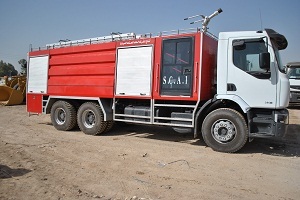 5- scai has good carry services to all cities in Iraq . A- brick factory ( alkadesyh- almahaweel- alswarha). Factory in najaf- cement factory and thermiston factory in karbala. Baghdad tower)) and installed the iron part above the restaurant. D- scai disassembled , transferred and rebuilt sheiters. F- scai designed, produced and installed the Fair. E- other vehicles like high pressure jet , vehicle for service of lighting.